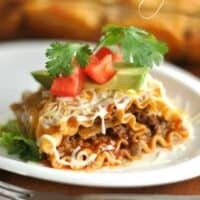 Enchilada Beef Roll Ups are a delicious meal idea. Packed with beef, enchilada sauce, and cheese, your family will love this tasty dinner! I seriously could eat Mexican food every single night. My husband loves it too, as do two of my kids. However, two of my children LOVE pasta. I would say they are part Italian, but they’re not. This dinner made everyone happy! The pasta lovers enjoyed the noodles, and the Mexican lovers enjoyed the spicy sauce! Don’t you love when a single meal can please everyone? This recipe takes a little extra work because you have to boil your lasagna noodles first. But, you can make this dish in the morning and cook it at dinner time. You can also make it the night before…I get how busy you all are!! First start by cooking your lasagna noodles according to the package directions. Once cooked, lay them flat on large sheets of parchment paper! Let cool while you prepare the filling. In a large skillet, brown ground beef until fully cooked. Drain and return to skillet. Add enchilada sauce, cuming, and mozzarella cheese. Set aside. In a small bowl, combine softened cream cheese with cumin. Set aside. 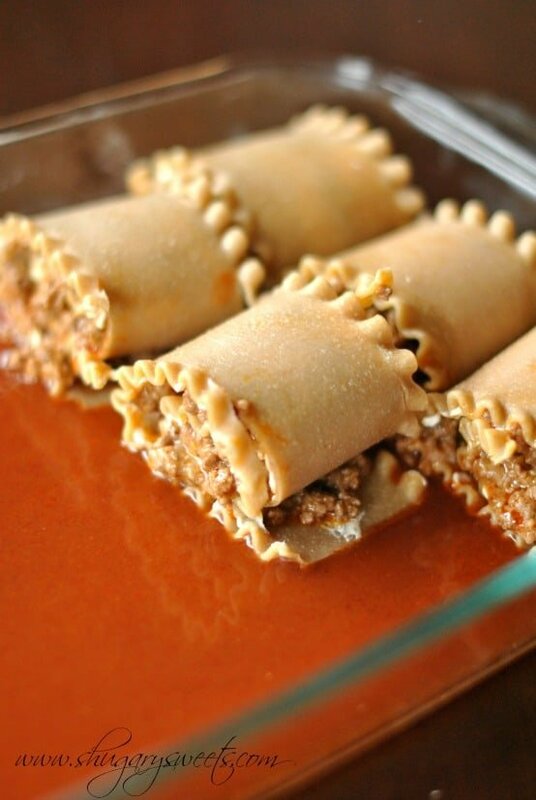 Pour half a can of red enchilada sauce into the bottom of a 13×9 baking dish. Using a small offset spatula, spread cream cheese mixture over lasagna noodles, using all the cheese until they are evenly coated. Top noodles with ground beef mixture. Roll up each lasagna noodle (don’t worry if some falls out) and place seam side down in prepared baking dish. Repeat until all 15 noodles are in the dish. Spoon leftover meat that feel out onto the noodles. Top with remaining half can of enchilada sauce and extra cheese. Cover with foil, bake for 30 minutes. Remove foil and top with remaining cheese. Bake uncovered for 5 more minutes until cheese is melted. Garnish like you would a taco using avocado (or guacamole), lettuce, tomato (or pico de gallo), sour cream, cilantro, etc! ENJOY! Can Enchilada Roll Ups be frozen? Yes! Today’s recipe makes a great freezer meal. 15 roll ups might be a lot for your family. Often times I double the recipe so that I’m working once and I can get three dinners out of this when doubled! Once you have all the rollups prepped, place them in an airtight container. If you’re looking for a 30-minute meal idea, these Chicken Avocado Enchiladas are the answer! Packed with flavor and loved by all! One of our favorite enchilada recipes is a soup made in the crockpot. This Slow Cooker Enchilada Soup is a family favorite, and easily doubles to feed a big crowd. I also freeze leftovers for lunches and dinners! This easy, stove top Chicken Enchilada Mac and Cheese is ready in 30 minutes and packed with flavor! The perfect weeknight dinner recipe! Getting three servings of Dairy each day is a goal for my family. Easy Stovetop Enchilada Mac and Cheese helps meet this goal! 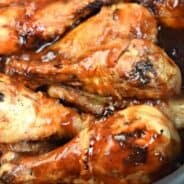 Dinner in 30 minutes! One of our favorite dinners, Taco Pizza! 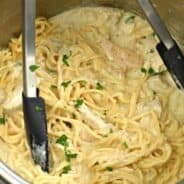 I love this easy meal, and it’s better than any pizza joint! Cinco de Mayo is right around the corner. How about making some delicious Enchilada Beef Rollups! Pour 1/2 can of enchilada sauce in bottom of 13x9 baking dish. Using a small spatula, spread cream cheese mixture over lasagna noodles, using all the cheese until evenly coated. Top with ground beef mixture. Roll up each noodle (don't worry if some falls out) and place seam side down in baking dish. Repeat until all 15 noodles are in dish. Spoon leftover meat (that fell out onto the parchment paper) onto the noodles. Top with remaining 1/2 can of enchilada sauce. Finish with 1 cup of colby jack cheese. Cover with foil and bake in a 350 degree oven for 30 minutes. Remove foil and top with remaining cheese. Heat until cheese is melted, about 5 minutes. Great idea using the lasagna noodles! I love that this is a combination of Mexican and Italian foods. Bravo! Thanks Eva! It sure was a family crowd pleaser! Well you’re welcome then! Enjoy Jess. I could eat Mexican food daily too! I think this is going in my repertoire! I could eat Mexican Food every single night too!! Glad I’m not alone in this! Thanks for stopping by Jenn! We could eat Mexican food every night too and never get tired of it. These look awesome!!! I’m thinking we need a family get together and have a big Mexican party. Are you in? WOWOWOW. Sorry, I’m so overwhelmed by this recipe and can’t even think of my big girl words to describe how amazing this looks! lol. I have this overwhelming desire to pop by for dinner right about now. This looks wicked good. Anytime 🙂 No guarantees there will be any food left! Love this, Aimee! It’s sheer genius! Enchilada Beef Rollups.. Girl these look insane.. Why couldn’t this have been my breakfast. I could and have eaten Mexican food every single night of the week! What a great recipe. I love enchiladas so I know I’ll love this. I’m putting this on my to-make list. Thanks for sharing! There’s something about enchilada’s thats so comforting! This sounds amazing! My kids love enchiladas and pasta so this should be a winner in our house! Aimee, I can’t wait to make these! 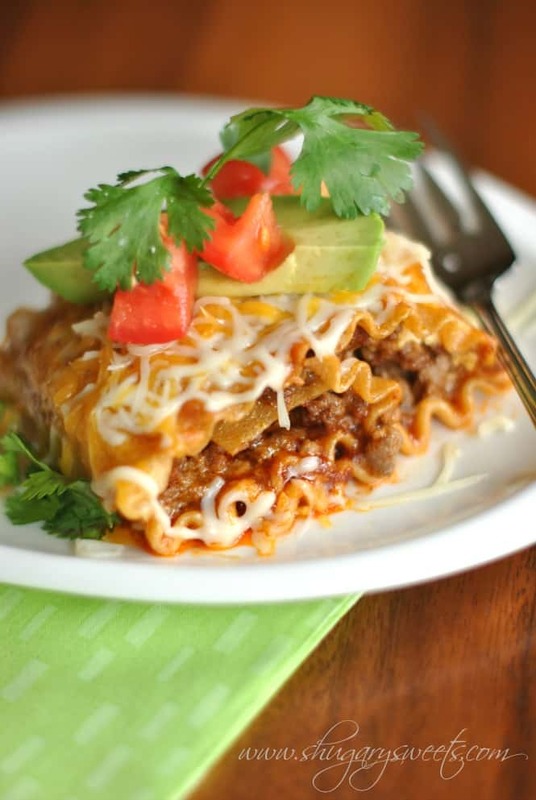 I love lasagna and you just turned enchiladas into mexican lasagna! 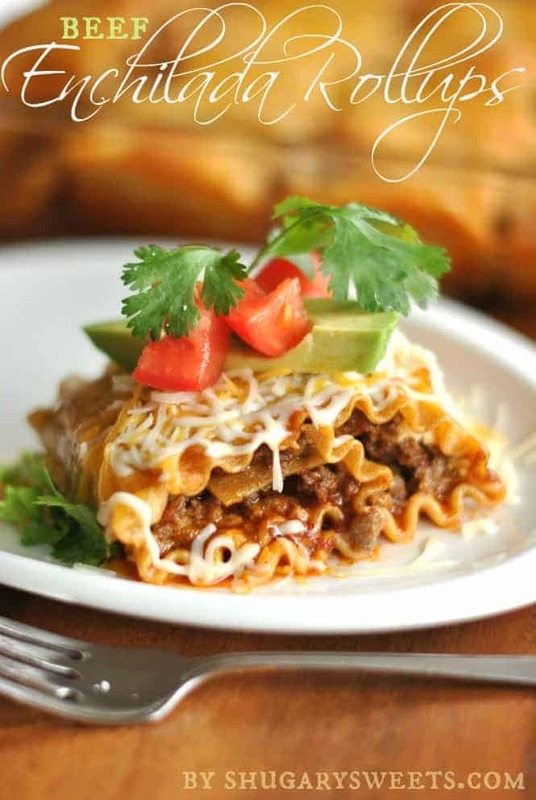 I just love what you’ve done here – two family favorites, lasagna and enchiladas, all in one! Brilliant!! Made this tonight b/c it just plain looked soooo good. Am so glad I pinned it. My kiddos (5,2) loved it and almost licked their plates clean. Thanks for sharing this, we’ll be using it again soon!! Karen I’m so glad to hear you all enjoyed the recipe! And even your little ones ate it!! I made this last night and it was so good. I usually change recipes a smidge but not this one. I brought it to a taste-tester at work and he said it was damn good. I will use this during football season for sure! I love pasta and I love enchiladas…perfect combo! I think I’ll try using Philly jalapeno cream cheese for some extra heat! Looks delicious!!!! I hate when I don’t read the recipe all the way through. I only browned 1 lb of hamburger meat and then couldn’t figure out why my meat mixture was spread thin by roll up #9. LOL Oh well, took left over noodles and made a “clean the fridge out” lasagna for later. I am definitely adding these to Mexican Mondays! Yum!! 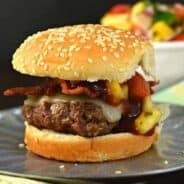 Super flavorful & easy to make! Love everything about these and can’t wait to make them! Love these as a game day snack! A new family favorite! My kids looooooved it!